Yahoo! 's Flickr has enhanced and brought photo location privacy controls to the next level. With Geofences the development team has innovatively increased the options to control geotagged photos. This also inherently increases people's comfort and therefore willingness to allow location data to be sent to Flickr. The implementation of the tool is simple and straight forward. 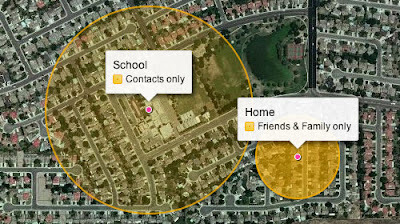 You can create a zone on the map that will assign a default sharing setting to photos geotagged within that location. The image below helps to understand that photos taken in non-yellow areas get your default privacy setting (probably "anyone") while pictures taken in the School or Home geofenced regions are more private. I love this idea and think it is an awesome step towards making people more comfortable with sharing their location of photos. One issue that many people may overlook is that you have to geocode your photos for this to work! People may inadvertently share more things publicly by thinking they took them within their geofence, but without location data attached to the image it will get the default setting instead. Flickr's geofence concept is an interesting one that could be further expanded. What if they flip it around in a way and give the option to only allow people to see specific photos if they are inside the geofence? That could be pretty powerful. Want to see and interact with exclusive pictures of such and such? Then you have to come to our location! Even on the personal side it would be akin to holding an actual photo album when you had to actually go over someones house to see it. How about a scavenger hunt of sorts where you have to be at a location to see the next hint, item, or location? Their are a lot of possibilities. With more location data being sent to Flickr I was interested in how they may internally use that data. Unfortunately their privacy section is not working; I asked them if it moved and will review the section when it becomes available.